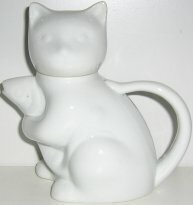 This white ceramic creamer features a cat holding a fish. This creamer is 5 1/4" high x 5" wide x 2 1/2" deep. Previously owned but no visible defects. Good quality.